Whether you are thinking about drilling a water well on your property or about buying land and would like to know the potential for drilling on that property, you should consider many things. Ground Water on the Move: Ground water is defined as underground water found in the pore space of rocks. Ground water does not stay underground forever, and it does not lie still waiting for us to draw it from a well. 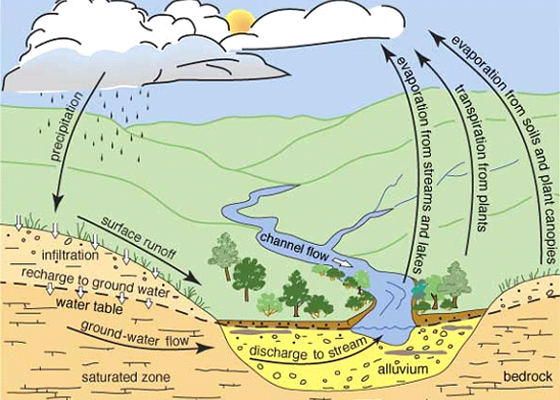 Ground water moves as part of the hydrologic cycle, the endless circulation of water from the atmosphere onto the surface and into the subsurface regions of the earth and then back from the surface to the atmosphere (fig. 1). Precipitation becomes surface water, soil moisture, and ground water. Like surface water, ground water flows toward and into streams, rivers, marshes, and lakes. Ground water circulates back to the surface in this way, and, from the surface, water returns to the atmosphere through evaporation and transpiration (plant respiration). The process by which water from rainfall and melting snow seeps into the soil and percolates into the saturated zone is called recharge. Places where recharge occurs are referred to as recharge areas. When this water reappears at the ground surface, this is called discharge. Besides flowing into streams, marshes, and lakes, ground water also may discharge in the form of springs and flowing wells. Ground Water and Aquifers: Many terms are used to describe the nature and extent of ground-water resources. The level below which all the pore spaces in the ground are filled with water is called the water table (fig. 1). The entire region below the water table is called the saturated zone, and water in this saturated zone is called ground water. The hydrologic cycle. Precipitation falls to the earth’s surface, runs off or infiltrates the ground, then moves back to the surface and into the atmosphere through transpiration or evaporation. The alluvial aquifer is the cross sectional area shown in yellow and labeled alluvium. An aquifer is an underground formation of permeable rock or loose material that can produce useful quantities of water when tapped by a well or as discharge via a spring. Porous media aquifers consist of aggregates of individual particles such as sand or gravel. Ground water fills and moves through the openings between the grains. Porous media where the grains are not connected to each other are unconsolidated. For example, an alluvial aquifer consists of loose sand, gravel, silt, and clay deposited in a stream valley or floodplain, and it is hydrologically connected to the stream flowing on its surface (figs. 1 and 2). In consolidated aquifers, such as sandstone aquifers, grains in the porous media are cemented together. 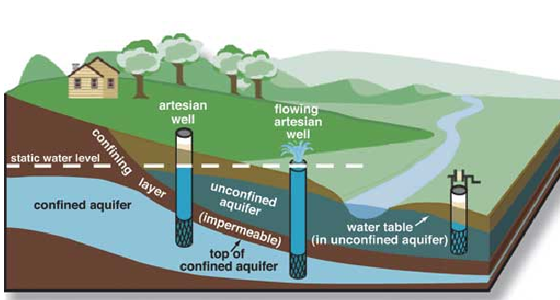 Figure 2–Confined and unconfined aquifers and how they affect water levels in wells screened in each type of aquifer. Fractured aquifers are rocks in which ground water moves through cracks, joints, or fractures in otherwise solid rock. Unconfined aquifers are bound by the water table; that is, they have no confining rock layers over the top of them (fig. 2). A well sunk into an unconfined aquifer will encounter water when the well reaches the water table, which is the approximate level at which water will stand in the well. Some aquifers, however, lie beneath layers of impermeable materials. These are called confined aquifers, or sometimes artesian aquifers. A well in such an aquifer is called an artesian well. The water in these wells rises above the top of the aquifer because of confining pressure; the level to which it rises is called the static water level. If the water level rises above the ground surface, a flowing artesian well occurs. Drilling a well into an unconfined aquifer is often easier and less expensive than drilling into a confined aquifer. Unconfined aquifers are generally nearer the surface, so wells are shallower. Also, many unconfined aquifers are unconsolidated (for example, alluvial aquifers), thus more easily drilled, whereas confined aquifers more often are reached by drilling through hard rock. On the other hand, near-surface, unconfined aquifers are more susceptible to contamination than confined aquifers that are sealed off from surface contaminants. Most well water is good quality because of the filtering process in the soil and the long travel time underground between the water occuring as rain which eventually reaches the well. However, in addition to possible pollution from agriculture, industry and transportation, even contamination sources in our homes can pose threats to ground water. Incorrect disposal of common household chemicals (polish, thinners, paints, etc. 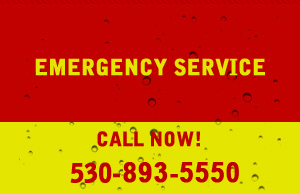 ), excess use of lawn chemicals, pesticides and garden chemicals, faulty or overladed septic tanks, or an accidental spill during an automobile driveway oil change, can wreak havoc with drinking water safety. Ground-water Quality and Contamination: Water is never found in a pure state in nature. Both ground water and surface water may contain many constituents, including minerals, microorganisms, gases, and inorganic and organic materials. Some are present naturally, and others are human-induced. The chemical nature of water continually changes as it moves through the hydrologic cycle. Although ground-water chemistry depends, in part, on the initial chemistry of the precipitation and recharge water, the most important natural changes in ground-water chemistry occur in the soil. Ground water may dissolve substances it encounters or it may deposit some of its constituents along the way. The eventual quality of the ground water depends on the kinds of rock and soil formations through which it flows. Thus, ground water in some areas may be too salty or contain too much bicarbonate of soda for domestic use or irrigation. Iron content can be very high in some settings, which usually does not render the water unusable, but it can be a nuisance because of rust staining of plumbing fixtures and an undesirable taste and smell. It is advisable to have the water in a new well tested to determine its quality and suitability for use. With the property owners help, the professional work of ground water specialists like W. S. Heitman Drilling & Pumps along with the regulation and technical work of government agencies, can help to ensure safe drinking water. What you know, and what you do about contamination risks are important for the safety of water in homes and communities throughout the US. The hole for most home wells is usually drilled at a diameter between 6 to 8 inches. The drilling method will depend on the geologic formations, the required water yield and the type of drilling equipment used. Drill rigs are expensive (often up to $800,000) and their use requires considerable skill. All wells require casing to protect them from possible contaminants at or near the ground surface. A liner may be used in place of casing in hard rock formations. For low-yield wells, to insure the pumping system is suitable for the customers needs, an extensive pump test is recommended to determine the draw down and recovery rate of the water in the well. Some sites may not be capable of producing the amount of water normally expected for domestic supply (30 gallons per minute [gpm]). However, with an adequate storage tank, a well producing as little as one gpm can be sufficient for domestic needs. In many wells, several hundreds of gallons of water are already stored in the well column. Every foot below water level of a 6-inch diameter well contains 1.5 gallons of water. Here’s the math: There are 1,440 minutes in every day. If a well produces 1 gpm, 1,440 gallons can be pumped in a storage tank daily. Assuming that each member of a family of 4 uses 75 gallons per day, that’s a total of 300 gallons. Total consumption for the entire family is less than 21 percent of the stored water. The well would be required to produce water for a total of only 5 hours a day in order to replenish the tank. Generally, 5 gallons per minute for 2 hours is considered the minimum acceptable yield in any 24 hour period. Wisely planned, a dependable water well can supply all the water you need now and into the future. A rule of thumb is to allow between 75 to 150 gallons per person per day. You need to take into account the peak demand, for example when there may be extra guests for holidays and weekends. Outside use of water can pose much greater demands. You need to calculate the required well yield if your well is needed for additional water uses such as swimming pools, irrigation, fire protection, heating & cooling, etc. Water from properly constructed wells is normally potable. Routine testing is performed on new wells for bacteria, mineral content, Ph, and turbidity. All of our well and pump installations are thoroughly disinfected using chlorine to kill bacteria that may have been introduced from the drilling and pump installation process. While the chlorinated water may be a temporary inconvenience, once pumped out of the system, it will provide the best chance for a potable water supply. Local and state jurisdictions, together with some lending institutions, may require additional testing for other potential contaminants – such as arsenic, radon and various man-made chemicals. It is Heitman Drilling’s recommendation to test your well water for potability at least once a year to insure it’s safe for you and your family. The names of local laboratories which we use in your area are available from your W.S. Heitman Drilling’s project manager. These labs are state certified and prompt. The American Ground Water Trust recommends that a written contract be executed prior to the start of any well drilling. This will give you an itemized list of expected costs. W. S. Heitman Drilling will inspect your site and prepare a printed agreement form that will reduce the chance for misunderstandings by identifying liabilities, responsibilities and uncertanties. Far too many homeowners have paid dearly for using amateurs or part-time, non-specialists for water well and pump installation work. W. S. Heitman Drilling is fully licensed, certified and insured for all the work we do. The AGWTcautions homeowners against high pressure sales or scare tactics and “bonus” offers to get your business. Property owners can become involved in litigation involving uninsured water well drillers. If an employee of an uninsured contractor is injured on your premises, you may be responsible for any resultant injuries or disabilities. In addition, you probably have no protection in the event of damage to your property or the property of others by the drilling company or pump installer during the course of the work. Proof of Worker’s Compensation insurance to protect the contractor’s employees or sub-contractors while working on your job. Be assured that W. S. Heitman Drilling & Pumps, as Northern California’s most reputable well drilling company, adheres to all of these recommendations by the AGWT.